NEW FOR SUMMER 2018! 5 min walk to the beach, village setting. Fisherman’s Cottage, 2 bedrooms, garden, short walk to the beach. Nestled in the heart of the village is Pickle Cottage, this charming cottage has both character and comfort. The accommodation boasts a wealth of traditional features. Refurbished and new to the market for 2018, fully equipped for a great holiday. Parking is available either at the free car park opposite or if busy at the owner’s property where there is secure parking for one car approximately 250m away. The property has 2 large bedrooms; one double and one with twin beds, the twin has a wall mounted freesat a TV. There is a spacious bathroom with bath and over bath electric shower. There is a cosy lounge with original slate floor, 2 large sofas large wall mounted Freesat TV and DVD player. There is an open plan kitchen and dining area, including slimline dishwasher, microwave and fridge with small freezer. There is also another fridge in the utility building. To the front of the cottage is a pretty bench seating area, great for sitting with a drink and watching the world go by. To the rear of the property there is an attractive courtyard garden, complete with bbq facilities. A utility building is available to use, with washing machine and sink. High chair, stair gates top and bottom of the stairs. Katrina and Arthur are both enthusiastic about offering high quality holidays. ‘We feel Pentewan has so much to offer, we live a short walk away from Pickle Cottage so are easily contactable if needed. We are happy to share tips on the best places to eat or lovely areas to visit’. Both work locally, Arthur a director of a building company and Katrina a dental hygienist who works in Fowey. This fisherman’s Cottage has a cosy feel to it, with many traditional features, however it includes at the mod cons needed for a great holiday, including TV, WiFi, dishwasher and washing machine. Child friendly, with high chair and stair gates. Room for your own travel cot if needed. Cornwall has so much to offer, this particular area being very picturesque and is popular with returning guests. It combines a village setting with a safe sandy beach for an ideal holiday destination. 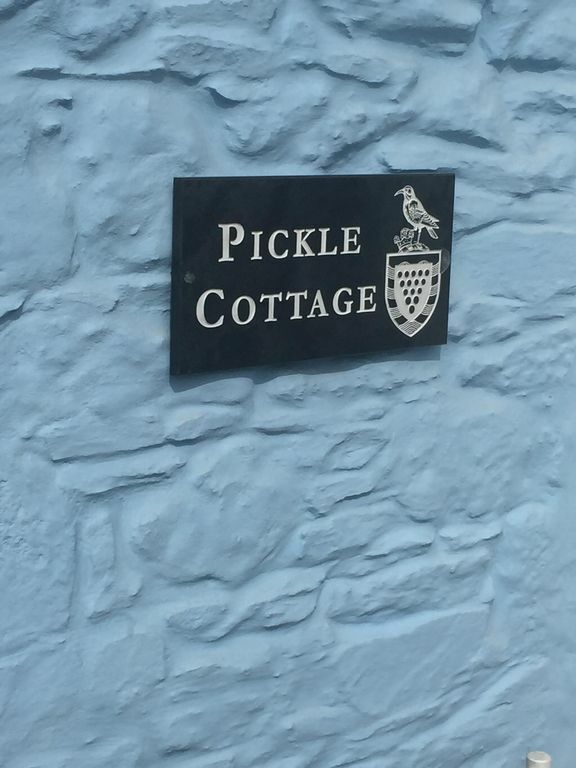 Pickle Cottage is set in the centre of the village, a stones throw from all the village amenities, and a short walk from the large sandy beach in Pentewan. Beautiful costal and woodland walks on the doorstep. Large bathroom with bath and overhead electric shower, toilet, sink and large towel rail. Towels provided, please provide your own beach towels. 2 sofas, wall mounted Freesat TV and Blueray DVD player. The garden/courtyard at the rear of the Cottage has a bbq area with seating. Laundry house containing washing machine. To the front of the Cottage there is bench seating. 2 businesses in the village hire out all water sport equipment. Bicycles can be hired during the season at the local cycle hire centre 100 metres away. Boat hire can be arranged at Pentewan Sands. Can be hired in the village. Local golf course in Porthpean 10 minute drive away. We had a long weekend in this fabulous cottage. The cottage is beautifully decorated, with everything you could possibly need. There is a lovely private split level garden which catches the sun in the afternoon and early evening, a great spot for star gazing too. The communication was really good with the owners, they are quick to respond to emails, and they were really helpful when they let us in to the cottage, telling us about the local area. They also left a welcome pack which included Prosecco and cream tea as well as tea, coffee and milk. The cottage is just a few mins walk to the beach. Thank you so much for your review. It’s lovely to get good feedback. We are so glad you enjoyed your stay in Pickle Cottage. We hope you will return again in the future. Kind regards Katrina and Arthur. The pretty costal village of Pentewan is a popular holiday destination for all. The long sandy beach is bisected by the White River and is safe for swimming and a range of water sports available form the beach or in the village. They include paddle boarding, kayaking diving, snorkelling,wind and kite surfing,surfing and body boarding. The picturesque fishing village of Mevagissey with its working harbour and narrow streets can be walked to via the costal path or a short drive away (approx 2 Miles). The costal path in either direction can take you to hidden coves and deserted beaches. For walkers and cyclists there is the Pentewan Valley Trail that takes you through woodland and riverside areas (there is bike hire available in the village). A short drive away there are the pretty costal villages of Mevagissey (2miles), Fowey (11 Miles), and. Charlestown (5 Miles,of Poldark fame). Eden project is 8 miles away, Lost Gardens of Heligan (2 Miles), Porthpean Golf Club 2.5 Miles, National Trust properties, Lanhydrock House 10 Miles.